Hurricane Maria, a Category 4 on the Saffir-Simpson Hurricane Wind Scale, became the strongest Puerto Rico landfalling hurricane since before the Great Depression, and continues to lash the island and the nearby Virgin Islands with destructive winds, flooding rain and storm surge. The eye of Maria came ashore near the town of Yabucoa, Puerto Rico, around 6:15 a.m. AST Wednesday as a Category 4 hurricane with maximum sustained winds of 155 mph. The eyewall of Maria continues to carve through Puerto Rico, passing just south San Juan, lashing the capital with eyewall winds. In advance of the eyewall, the National Weather Service issued a "extreme wind warnings" for several eastern Puerto Rico municipalities. Here are a sampling of peak wind gusts seen so far in Puerto Rico and the Virgin Islands as of early Wednesday morning. Thanks to NOAA meteorologist Alex Lamers for assistance compiling these peak gusts. A storm surge of over 5 feet was recorded by a NOAA tide gauge at Yabucoa Harbor, Puerto Rico, and intense south-southeast winds continue to pile water into the harbor on the east side of Maria's circulation. According to NWS-San Juan, rain rates approached 5 to 7 inches per hour Wednesday morning. This torrential rain prompted flash flood warnings in much of Puerto Rico and parts of the Virgin Islands. A flash flood emergency was issued for the Rio de La Plata Basin in central Puerto Rico. River levels had risen 20 feet since midnight near the town of Comerio. Over a dozen river gauges reported levels above flood stage. The Rio Grande de Manati near Ciales shattered its previous record and the Rio Gurabo at Gurabo was rapidly nearing its record crest set in September 1960. The National Weather Service office in San Juan, Puerto Rico, warned of "catastrophic damage" from Maria's winds, as well as "life-threatening rainfall flooding having possible devastating impacts" in a hurricane local statement issued Wednesday morning. Maria was the strongest Puerto Rico landfall since the Category 5 September 1928 San Felipe/Lake Okeechobee hurricane. Prior to both Irma and Maria, only four other Category 4 hurricanes had tracked within 75 miles of central Puerto Rico in historical records dating to the late 19th century. Hurricane Hugo in 1989 was the last to do so prior to 2017, though it had weakened to a Category 3 hurricane as it clipped the northeast tip of Puerto Rico, according to the NOAA best tracks database. Hurricane warnings have now been issued for the Turks and Caicos Islands and southeast Bahamas. Hurricane warnings mean hurricane conditions are expected within 36 hours. Hurricane warnings remains in effect for the U.S. and British Virgin Islands, Puerto Rico, Culebra, Vieques and in the Dominican Republic from Cabo Engano to Puerto Plata. A tropical storm warning has been issued for Saba, St. Eustatius, St. Maarten, from west of Puerto Plata to the northern border of the Dominican Republic and Haiti and from west of Cabo Engano to Punta Palenque in the Dominican Republic. Hurricane watches also include St. Maarten, St. Martin, St. Barthelemy and in the Dominican Republic from Isla Saona to Cabo Engano. Maria's core will continue to carve across Puerto Rico with destructive winds, storm surge flooding at the coast, and flooding rain Wednesday before pulling away Wednesday evening. Conditions in the Virgin Islands will slowly improve Wednesday, though some bands of heavy rain and at least tropical storm-force winds may persist for a time. Portions of the Dominican Republic, particularly near the north coast, may see hurricane-force winds develop as soon as Wednesday evening continuing into at least Thursday morning. There is still some uncertainty, as any slight jog of the eyewall north could keep the most intense winds off the coast of the Dominican Republic. In the southeast Bahamas, Turks and Caicos, hurricane conditions are expected to arrive by late Thursday, but conditions will already begin to deteriorate, there, by Thursday morning. A life-threatening storm surge raising water levels up to 6 to 9 feet above ground is possible in Puerto Rico and the Virgin Islands. In the hurricane warning area of the Dominican Republic, water levels may rise by as much as 4 to 6 feet above normal tide levels, with a storm surge of 1 to 3 feet possible elsewhere along the northern coasts of the Dominican Republic and Haiti. Water levels up to 10 to 15 feet above normal tide levels are expected near and north of the center of Maria in the southeast Bahamas, as well as the Turks and Caicos. Puerto Rico may see 12 to 18 inches of rain, with locally up to 25 inches in some areas, through Friday. The Virgin Islands are expected to receive a total of 8 to 12 inches of rain, with locally up to 16 inches. The northern and eastern Dominican Republic, as well as the Turks and Caicos are forecast to pick up 4 to 8 inches of rain, with isolated 12-inch amounts. These rainfall totals have the potential to produce widespread, life-threatening, potentially catastrophic flooding and mudslides. 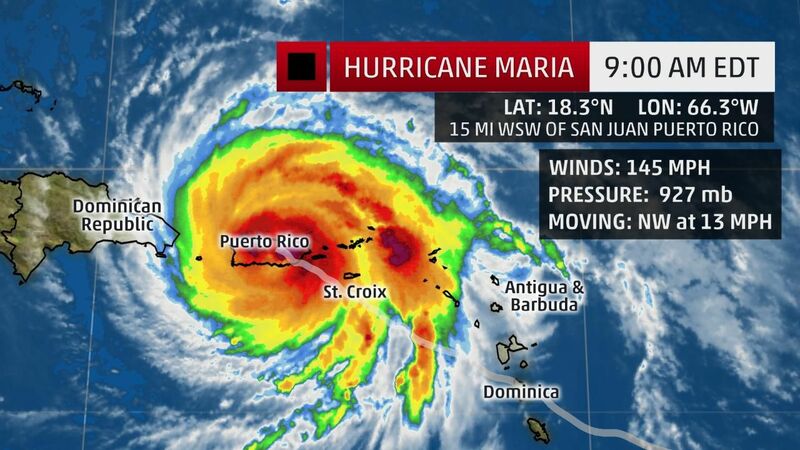 Will Maria Threaten the U.S. East Coast? It is still too soon to determine at this time whether Maria will directly impact the East Coast of the U.S. next week. The potential involves a complicated upper-level pattern including a weakening Jose, a building upper-level high pressure system, then an arriving southward plunge of the jet stream into the East. For now, all residents along the East Coast should monitor the progress of Maria.